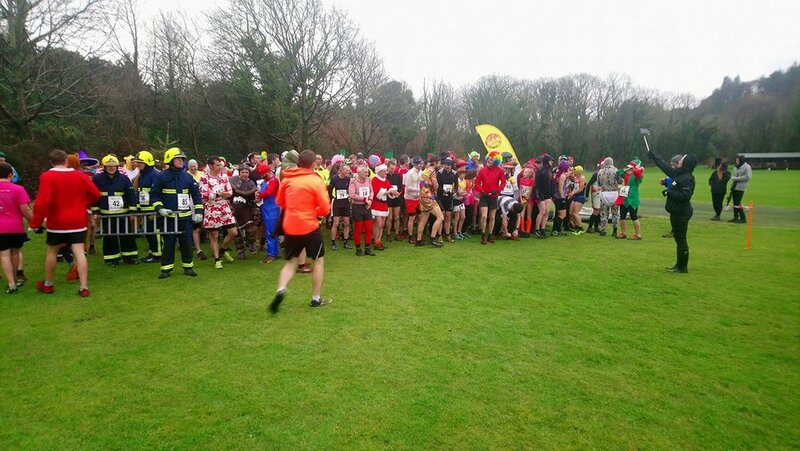 The third counter in the 2018 Callin Wild Manx Fell Running league takes place on Saturday 10th March with the inaugural running of the Slooby Dhoo race. This AS category race is a shortened version of the Ellan Vannin fell race, taking runners from Ballaugh Plantation, through Glen Dhoo reserve before climbing Slieau Curn. Runners then descend south into the valley before tackling what is probably the most daunting climb in Manx fell running - Slieau Freoaghane! This beast of a slope often requires the use of all four limbs as it climbs to the 488m summit. From this point though it is largely all down hill as you traverse over to Slieau Dhoo and then drop down into the Ballaugh valley once more before returning to the start/finish area. Registration is from 12:30 at Ballaugh Plantation car park. Minimum age on race day is 16. Any runners under 18 must complete a parental consent form and bring it to the race. Everyone welcome for a post race refreshment in the Raven afterwards. Marshals are still required for this race - please get in touch if you are available to help out. Entries are now open for this English Championship counter to be held on Saturday July 14th. The course has been revised slightly from the last used course with a new checkpoint being introduced on the south easterly slope of South Barrule. The checkpoint will be located at a stile on the corner of Corlea plantation and is not difficult to locate with it being on the first fence you reach after turning off from the round table in an easterly direction. Note also that Bradda/Milners Tower is NOT a checkpoint and does not need to be visited/touched on the outbound OR return. Full safety kit, including emergency food is required for this race. Race starts at 10am, registration from 9am at Bradda Cafe Car Park. A captive audience of runners tuned into the pre-race safety brief! Thanks to all the helpers, marshals, timekeepers, landowners, runners and cake makers! Just two weeks until Bradda! The opening round of the 2018 Callin Wild sponsored Manx Fell Running League will take place on Saturday 27th January. The Ard Whallan race will start and finish at the Outdoor Pursuits Centre in West Baldwin where registration will be open from 12.15pm. Race will start at 1.30pm and will be over a 12km route that includes 750m of ascent. Full safety gear is mandatory for all competitors and this will be checked at registration. Minimum age for entry is 18 years on race day. Pre entry is now closed but you can still enter on the day. There is limited car parking at the Centre plus space at the Colden car park and a few spaces on the West Baldwin road but if parking here please do so with care. We would strongly advise car sharing. Changing facilities, showers and post race refreshments will be available. The race will be our annual cake race with competitors invited to bring along a home baked treat. The route has changed slightly from last year and will revert to the same course as 2016 - runners must go through the Cronk Breck gate safety control and then over to Greeba summit. We have the option of booking the hostel again this year for anyone who fancies staying the night. Please get in touch if you are interested as we need a few to make it worth proceeding with. It was a good laugh last year. A few beers are optional! We have had a small response to the request for marshals but we still need the following helpers for race day. Names have to be in by 20th January. Valley manned safety control, 1 helper. Cronk Breck Track manned safety control, 1 helper. Slieau Ruy summit manned safety control, 2 helpers. There is no compulsory marshalllng stint to qualify for the league in 2018. We are relying on regular runners to volunteer so that we can cover our marshalling obligations. Contact us if you are able to help out. Runners take shelter from the bracing wind before the start! Very nearly a record entry today which was excellent given the conditions! Many thanks to all the marshals who stood out in the wind and rain, helpers, timekeepers and of course the runners who all made it a great start to 2018! Ben Corkill took the victory, closely tracked by the ever improving and training partner Orran Smith. Tom Cringle claimed 3rd ahead of Nick Colburn with top young cyclists Max Walker and Will Corkill proving themselves equally adept on two feet to round off the top 6. Alice Forster was the first lady (14th overall) ahead of Eleanor Miklos and Elissa Morris. The race was also the first round of the inaugural Junior Championships for U13+ categories - separate results for each of the junior categories will be published later. One of the highlights of the local sporting calendar takes place on New Years Day with the St John's Fell Race, sponsored by David Cretney. This annual event will take place at 1:30pm at the St John's & Peel Cricket field with registration from 12:15pm inside the St John's FC Clubhouse. Please avoid the playing areas on both grounds. Online registration is now closed but entries will also we available on the day. Fancy dress is encouraged but please bear in mind the race is held under FRA rules so nothing too extreme please! Ample parking is available at the football club, the old railway station car park and the DEFA car park on Foxdale Road. Please park responsibly. All competitors are strongly advised to carry a waterproof jacket - this will be compulsory if weather conditions are very poor. Headphones of any description are not permitted. The 5km course is fully marked and is an exciting challenge to start the New Year. The race will also incorporate the opening round of the Junior Fell Running League which will be held over the short races in this year's league. Minimum age is 12. Further details on the remaining junior league races will follow. Refreshments will be served afterwards in the Clubhouse and the bar is open. All entry fees will go toward the Ramsey Pier Restoration fund. All other donations accepted.